The first few days in ICU were pretty surreal. I had a lot of adapting to do and a lot of small procedures to get through. A nasogastric tube was inserted so that I could be fed. I had a catheter in to catch urine. I had a pic line put in, which is an IV access line that can be kept in for a longer period than regular IVs. 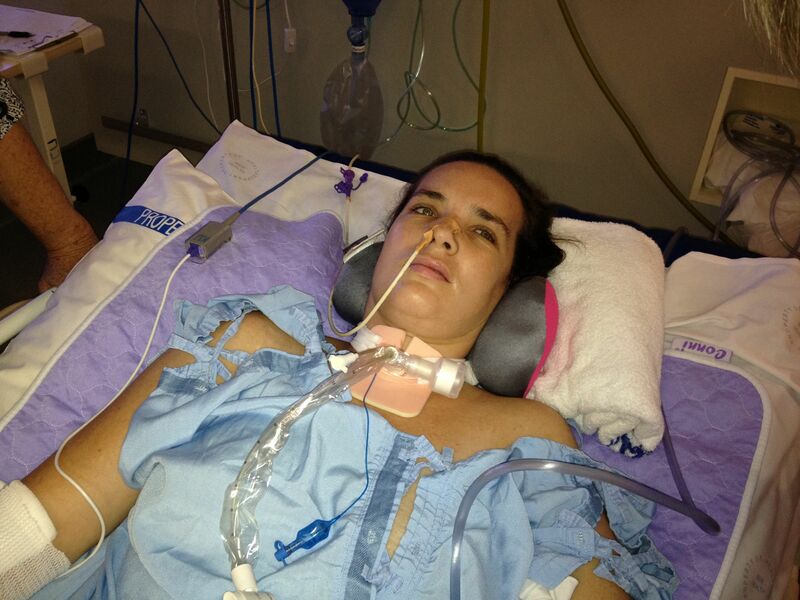 I was still intubated and ventilated because I could not breath sufficiently on my own. And then of course were all the monitors. My neurologist took Steve aside and warned him of my prognosis. He made it quite clear that if I survived, there was a good chance that I would remain Locked-In. He told Steve that if I was to remain Locked-In, I may not wish to live. On my 2nd morning in ICU, I was pretty alert. I must have known I was in a pretty bad way because I spelt the letters D I E out to Steve. After that little incident, doctors decided they wanted to put in a trachy instead. A tracheostomy is a surgical procedure to create an opening through the neck into the trachea (windpipe). A tube is then placed through this opening to provide an airway and to remove secretions from the lungs. I was very reluctant at first to have it done. I can’t remember exactly why. I think part of it was that I felt starting to have procedures done for my management in the long term was admitting that I had permanent health problems. I was still partly in denial ant not ready to accept my reality. The idea of having someone cut a hole in my windpipe was not very appealing to me either. Steve explained to me that it wasn’t permanent and could be removed at any time. He also made me realise that it would be a lot more comfortable than having the tube and bit block in my mouth. He also felt that it might be less scary for the kids. I trust Steve so completely that I agreed. So the medical team arrived to do the procedure. A young female doctor was going to do it under the supervision of a senior doctor. When she turned and asked him, “Where do I cut?”, I was a little taken aback. So he proceeded to explain to her how to go about the procedure. He felt the need to emphasize that she shouldn’t cut until I was asleep. Surely they cover that in med school – do not cut a patient until they are asleep! I wished I could have called out, ‘Hello, I’m right here and I can hear you.’ The next thing I remember is waking up with a trachy in place – she had done a great job. Every morning for the first 2 weeks, I begged Steve to let me die. This was no life for him and the kids. So in retrospect, my mind was completely divided on my situation. I was somewhat in denial, yet at the same time I must have had a sense of hopelessness to want to die. Every morning he begged me to just give it 1 more day. Do you know how hard it is to argue when all you can do is blink? It just doesn’t have quite the same impact as raising your voice. The length of our discussions would depend on how tired I was, and how emotionally strong Steve was feeling. Many times I tried to convince him that he and the kids would be better off without me (what did I have to offer as a wife and Mum). From the moment I gave birth to my kids, my life ceased to exist as an independent entity. It just came naturally to me to think only of the impact on Steve and the kids. It just didn’t seem like a big or difficult decision. It really seemed like the logical decision which in my mind made it a simple and easy decision to make. Steve has a son from a previous marriage. After his marriage ended, Steve was in a long-term relationship with another woman. This woman did not love Tristan, or treat him the way he deserved to be treated. Steve had learned a lot from this relationship and I knew with 100% certainty that he would never allow this to happen again. So I begged him to find someone new. To find someone he could live the sort of life with that we had planned for our family. Still this fell on deaf ears. With each passing day I knew that my medical condition was stabilizing. I knew that this would make it more difficult for me to die if the decision was finally made to allow this to happen. So, I felt a sense of urgency. I needed to convince him fast. Some might say I was like a dog with a bone. My neurologist was going away for a week over Christmas. He told us that if I was still asking to die when he got back, that he would respect my choice. After 2 weeks, I gave up asking, accepting that recovering as best I could was now job. If I was going to be alive, I sure as hell didn’t plan on staying like this. If you ask Steve now he will say that I stopped asking to die. I would argue that I just gave up asking. So please know that this is by no means where I am at now. But it is a very honest account of where I was at the time. My family quickly organised a 24 hour roster so that I was never alone. More on that later. Here is something my sister wrote on her first shift sitting by my bedside, just 24 hours after my stroke. I found it just recently and was very touched. It helps to give you an insight in to what my family was going through. Warning – you will need tissues! This was such a privilege to read. Thank you for this honest, strong and vulnerable account of this crucial part of your journey. Your resilience is something to be celebrated.